Whether you're wrapping up your back to school shopping or just starting out, don't forget to include the coolest, safest waste-free lunch gear on the market - and we can help. 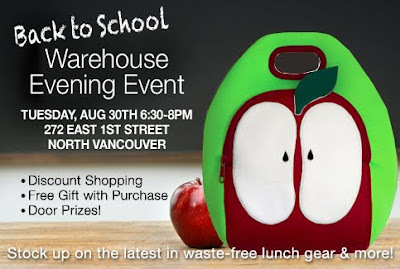 Stop by our Lavish & Lime Back to School Warehouse Evening Event on Tuesday, August 30th, 6:30-8pm at 272 East 1st Street in North Vancouver's trendy Lower Lonsdale area (Lolo). We'll have all the latest lunch gear on the market available for you check out, plus a selection of top backpacks and some green school supplies too. Hope you can join us - we'd love to meet you!